Amanda Nunes stunned Miesha Tate to win the Bantamweight belt while Brock Lesnar was victorious in his return to culminate a historic night at UFC 200. In the confines of the brand-new T-Mobile Arena, Jose Aldo also captured the Interim Featherweight strap with a superb performance against Frankie Edgar, while Daniel Cormier smothered Anderson Silva for a decision victory. The night began with Fight Pass prelims, and there wasn't much action - simply because all three fights ended as first-round stoppages. With the UFC rolling out an eccentric yellow canvas for the event, they were keen to look good on it. Miller pounded out Gomi after some dominant grappling, while Mousasi dropped Santos after a similar approach. 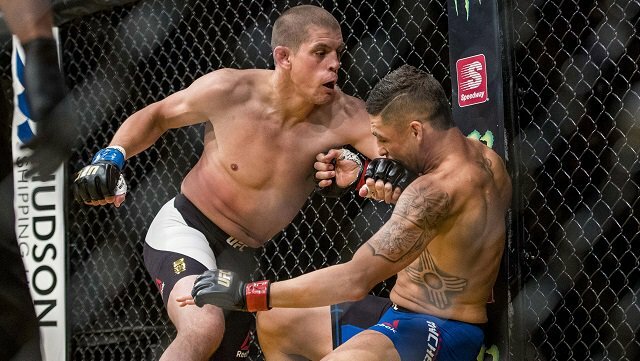 In addition, Joe Lauzon put on one of the best performances of his career when he became the first man to stop Diego Sanchez with strikes. Sage Northcutt, back at Lightweight, didn't set the world alight in his return but did the necessary to score a unanimous decision over Enrique Marin. While he did show many holes in his game with the weakness in grappling, he was able to do enough and get back to winning ways. Then, former champion TJ Dillashaw technically outpointed Raphael Assuncao to avenge his prior loss to the Brazilian and move closer to getting the title back which he lost earlier in the year. His movement and footwork was far too much for his opponent to handle, coming of a layoff spanning a few months south of two years. He was bloodied up by the conclusion of the fight, as Dillashaw marched to victory. Kelvin Gastelum followed that up by defeating Johny Hendricks in similar fashion. Previous winner of The Ultimate Fighter, the rising star had the former champion in trouble on numerous occasions, although not enough to put him away. It raised questions of "Big Rigg" for the future, while Gastelum is set to propel up the ranking with a win over a man who, not too long ago, was at the top of the heap at 170 lbs. Julianna Pena closed off the preliminary bouts as she ground out a decision win over previous title challenger Cat Zingano. "The Venezuelan Vixen" used her grappling skills to control Zingano in a gruelling contest for both women, but her choke attempt in the third round was significant on the scorecards, winning two rounds to one. The return of former Heavyweight kingpin Cain Velasquez provided an electric start to the main card, as Cain Velasquez triumphed in the dying seconds of round one to finish Travis Browne. The Mexican set the pace right off the bat, looking for the overhand rights to try and find the chin of his tall Hawaiian counterpart, before nailing a wheel kick out of nowhere which opened up for a barrage of shots. He would then drop Browne, and followed it up with strikes when he flattened him out, giving Cain just what he needed - a first round knockout to get back on track and start climbing the ladder to the gold once again. Following that up, Jose Aldo would capture the Interim Featherweight belt and set up a potential Conor McGregor rematch after producing one of his best career performances against Frankie Edgar. The Brazilian was too quick, too powerful, and too equipped to stop the takedowns and counter-punch his opponent, making this fight a lot less closer than the first meeting between the two. Edgar did find some success with kicks, but not enough to phase the greatest Featherweight champion in the history of the sport. Instead, he threw needs, some great jab-straight combinations and much more, eventually getting his hands on the belt with a unanimous decision triumph - and now a rematch with the "Notorious" is on the cards. If somehow that wasn't enough then the UFC had even more to offer. 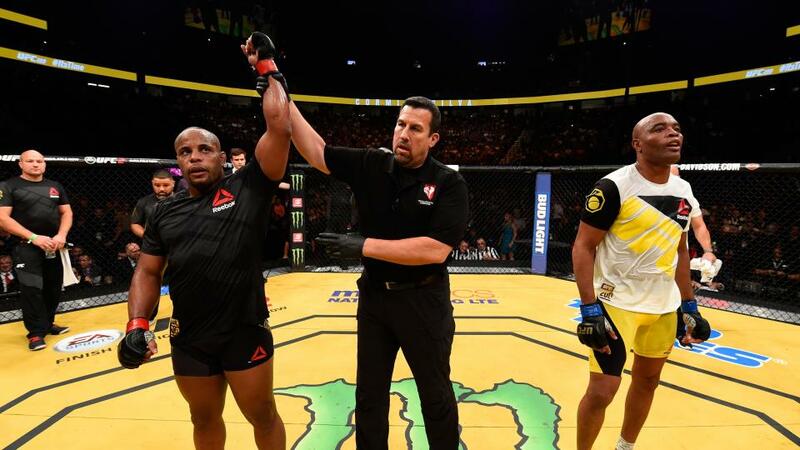 Daniel Cormier smothered Anderson Silva - the short notice replacement for Jon Jones - over three rounds in a contest which left many fans expressing discontent inside the T-Mobile Arena. "The Spider" looked dangerous on the feet as he threatened with kicks and knees, but was soon takedown by Cormier who snuck in short elbows and punches. This occured throughout the fight, with Anderson just managing to keep the leg tied down to prevent the Light Heavvyweight champion posturing up. With 2 minutes remaining of the third round, though, the referee stood them up, where Anderson would hurt Cormier with a body kick, although he managed to survive and clinch up against the fence to triumph over the greatest of all time. Brock Lesnar made a victorious return to the Octagon when he scored a unanimous decision victory over Mark Hunt, testing the chin of the Samoan warrior with some relentless ground-and-pound and avoiding any big shots from the Heavyweight. Lesnar stayed on the outside for most of when the fight was played out at striking range, before level changing to try and secure takedowns where he did most of the damage in the half-guard, and later in full mount towards the end of the fight. He couldn't get the finish though, despite strong showings in two of the rounds, perhaps opening the door for further fights down the line. In a fight which unexpectedly became the main event after a rollercoaster ride on fight week, Amanda Nunes stunned Miesha Tate with a first-round submission to become Brazil's first ever female UFC champion. It was her striking which changed the complexion of the fight early on, landing a hard right hand which had "Cupcake" reeling. Some more shots as she backtracked eventually saw her stumble to the canvas, where Nunes would end up taking her back, finding the rear-naked choke, and forcing the tap. UFC 200 ended in shocking fashion, and no matter what happens, the sport continues to surprise us. It was a celebration that will go down in history. UFC marks a milestone with the greatest card in the sports history, as a stellar card brings the Octagon to the T-Mobile Arena in Las Vegas for UFC 200. After a rocky road which featured a retirement saga of Conor McGregor, along with a late positive drugs test for Jon Jones which left the title fight in tatters, anticipation is reaching fever pitch. Headlined by the Women's Bantamweight Championship title fight between Miesha Tate and Amanda Nunes - a questionable call from the organisation's brass, there's a lot more going on before that, with one of the greatest of all time stepping in on 2 days notice, arguably the biggest draw in the world of combat and a resurgent champion. But even that doesn't equate to scratching the surface of all that will make up the incredible pay-per-view. Brock Lesnar will make his long-awaited return to the Octagon as the Beast returns to face Mark Hunt in a colossal Heavyweight bout. Just over a month out, the announcement of his inclusion sent shockwaves and generated an incomparable buzz around the sporting world, with the WWE - who he is currently under contract with - allowing the former champion to perform at the spectacle, saving the event to an extent. It was a night earmarked by everyone in the sport for a year prior, but the unravelling of many plans and the rollercoaster ride that is mixed martial arts made nothing certain. Ronda Rousey's hiatus would take longer than expected after she was dethroned by Holly Holm, while Conor McGregor suffered a shock loss to Nate Diaz - although the rematch would be on the cards to headline the event. "The Notorious" did however end up being pulled from that event, refusing to attend a press conference and shaking up Twitter with a retirement Tweet. Returning pound-for-pound king Jon Jones would then take over the headlining spot with a rematch against bitter rival and current champion Daniel Cormier. It was a main event which was worthy of headlining such a card with the unification of the championships - but it wasn't meant to be. After more back and forth with incomparable beef, Jon Jones would be pulled from the card during the fight week - meaning just days before the biggest event in their history, UFC 200's main event was no more. A USADA positive drug test kept "Bones" out, however the show would go on with his nemesis. Following a road of twists and turns, here we are. UFC 200 - a mouthwatering preliminary undercard of some of the best fighters on the planet, and then the best assembly of five fights in combat history. Las Vegas will stand still as the eyes of the world are fixed on the brand new T-Mobile Arena. There's little need to hold back on the superlatives. History will be marked, and then history will be made. It will all start in the realms of the digital streaming service, UFC Fight Pass, with three fights that will set the tone if not raise the bar - and give the rest of the fighters a tough task in outdoing them. PRIDE promotions and mixed martial arts pioneer Takanori Gomi meets Jim Miller, a man no stranger to the mat or fight pass bonuses. Expect them to come firing out of the blocks, before Gegard Mousasi, an elite Middleweight, then looks to climb the ladder as he faces replacement opponent Thiago Santos, hanging just outside the rankings. Concluding that portion of the card will be an inevitably bloody affair, as the aggressive Diego Sanchez looks to topple another fight of the night merchant in Joe Lauzon. Sage Northcutt then makes a return bouncing back from his first loss to battle Enrique Marin in the Lightweight division, with all eyes on how the star from "Looking for a Fight" can get back on track. He remains an explosive competitor, and did look incredibly different in his January bout, and can steady the ship. Then, former Bantamweight king TJ Dillashaw will look to stake his claim for another title shot when he meets Raphael Assuncao, in a rematch from their close fight in October 2013 which was a split decision in favour of the Brazilian. He does however return from a layoff dating back to October 2014, still riding a seven fight win streak, so whoever gets their hand raised in the second televised prelim will have champion Dominick Cruz in their sights. Johny Hendricks, another former champion, had some troubles making weight and missed the limit just slightly, meaning he will surrender a portion of his fight purse to opponent and rising star Kelvin Gastelum. Nonetheless, he'll be hell bent on redemption having suffered a first-round TKO defeat to Stephen Thompson, while Gastelum - aware of weight issues in his past - has a lot to prove, with a win over the former champion accelerating his career to huge heights. A blockbuster Women's Bantamweight fight will stand atop the prelims as Julianna Pena battles Cat Zingano, another fight with huge title implications. The "Alpha Cat" saw her only loss come to Ronda Rousey in a 14-second submission, and will intend to take one step in the right direction with a return over The Ultimate Fighter winner. Having also knocked out the current champion on the night, Tate, in the second women's UFC fight in history, the danger is clear and it will be an intense scrap. 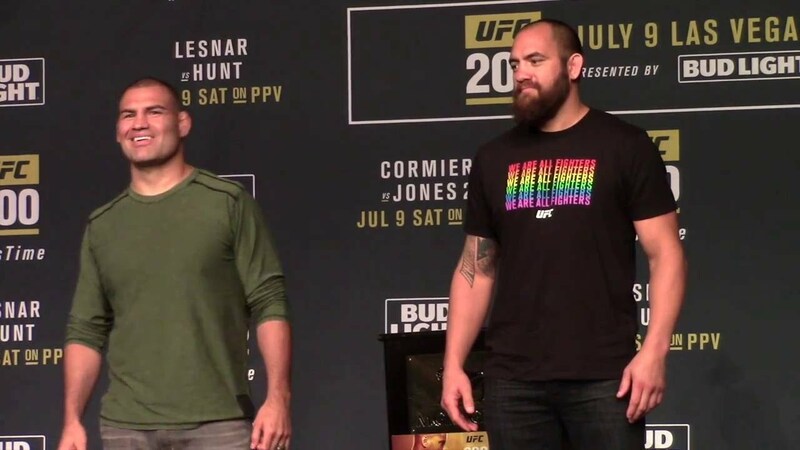 The return of former Heavyweight champion Cain Velasquez will kick off a star studded main card, with a terrific stylistic matchup as "Hapa" Travis Browne shares the Octagon with him. Velasquez had seemed unbeatable at a point where he ruled the Heavyweight kingdom, although was submitted by Werdum in Mexico City more than a year ago. Having overcome injuries, Velasquez will look to topple the tall lengthy fighter, who will possess a lot of danger himself. Jose Aldo and Frankie Edgar then rematch - incredibly early in the card - as the Interim Featherweight championship is up for grabs, and potentially a shot at 145 lbs ruler Conor McGregor. The American has been on a tear, most recently dispatching Chad Mendes with a first-round knockout to put an exclamation mark on a win streak. That win streak stemmed after losing a close, courageous fight with Jose Aldo, who himself had enjoyed dominance until he was dethroned in 13 seconds. There's so many questions about this fight, but whether or not it's a good one is out of the question. You have two elite Featherweights who want to be champion again, and both will put on a spectacle that's worth all the bucks for UFC 200. Yet, there's even more to come. Widely considered as the greatest of all time, Anderson Silva stepped in on just 2 days notice to replace Jon Jones after he was pulled off for a positive drug test result from USADA. Daniel Cormier, the Light Heavyweight champion, awaits in a non-title three round fight, but one which came together in the matter of hours, while garnering so much anticipation. A win for Silva will put him in line for a shot back down at his native division, although Light Heavyweight is no foreign ground for the Brazilian, who is undefeated there after some lethal finishes. Cormier though, is probably the second best in the division, perhaps the first but the UFC 200 main event cancellation prolongs that question, and will be a big threat to "The Spider", with his aggression, pressure and heart making it a tough fight for Silva, who will look to outstrike him with his established skills. It's a massive fight, one few could have dreamed of as it was unthinkable - but one that everyone now wants to see. In the co-main event, the Beast will be unleashed. Former UFC heavyweight champion Brock Lesnar shocked the world when his return to the cage was announced for the event, and he has quite the return when knockout artist Mark Hunt faces him. He's proven on countless occasions that he can stop a fight within the space of one punch, and may land should Lesnar's usual tactics of charging at his opponent occur. Then again, since Lesnar's last fight, a lot has happened - his physicality has changed, maybe his style, and of course there's no more diverticulisis, meaning Lesnar could be at his best ever. The bookies have him as the underdog, and rightly so - for pretty much any man in the world coming off a few years layoff to get back in there and mix it up with Mark Hunt. Regardless, Lesnar will bring in the viewers as one of the biggest PPV attractions on Earth, and it will be an occasion to remember. And in the main event, Miesha Tate and Amanda Nunes finish it all off. Nunes has only lost once, and works to finish the fights with aggression and technical ability while Tate will make it a brawl and a display of who has more heart and courage. It's a marquee moment for the evolution of women in the sport, headlining the biggest event in history after a stark turn of events. UFC 200 will be a spectacle. So much talent, so much history and so many moments. They have their place in the record books, and its now time to mark it with the turning of a new chapter.